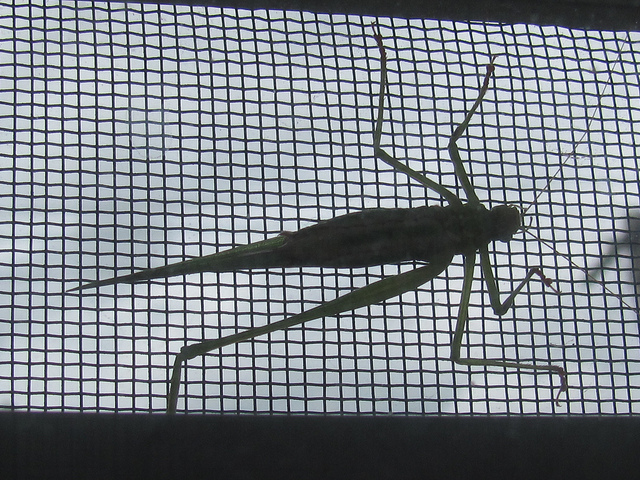 Fork-tailed Katydid (Scuddera furcata) stuck on my bedroom window screen. Photo by Donna Long. 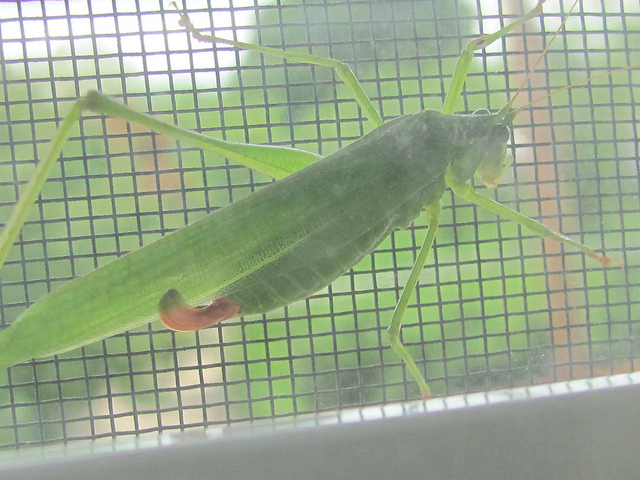 A Fork-tailed Bush Katydid (Scuddera furcata) was stuck between the front bedroom window for most of yesterday morning. I guess she managed to wedge herself between the window glass and the screen during yesterday’s thunderstorms. She was stuck for several hours. 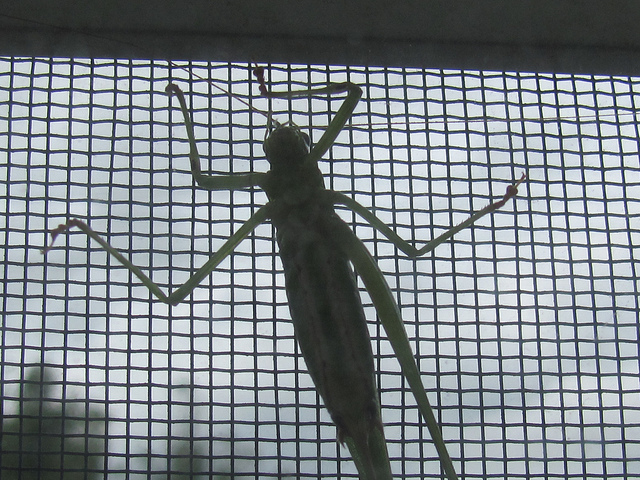 She would climb to the top of the screen, wave her long, thread-like antenna over the edge of the screen into the outside air, and then head the opposite way back down into the window. She was so close to freedom and turned around. I am not sure what she was doing but after several hours of watching this happen again and again, I took a letter opener and decided to speed things along. I unlocked the windows and screens and pushed her out into the warm, humid afternoon air. I am not sure she appreciated it because she just crawled into the window track. Fork-tailed Katydid (Scuddera furcata). Photo by Donna L. Long. I just studied what she looked like after all this. I knew she was a she by the stout, up-curved ovipositor underneath her abdomen. I think it looks like an Elizabethan codpiece. It would be even funnier if she were a he. The female katydid uses this body part to deposit her eggs deep in soil or rotting wood. Hopefully, out of reach of animals that would eat the eggs. When the larvae hatch from the eggs, they are multi-colored and horned. Wicked. I wondered what I would look like multi-colored and horned? They most sad thing about this katydid is that is only has one leg. When she has both, her long powerful legs are used for jumping. No jumping for this katydid. I guess this explains some of her behavior yesterday morning.